If you’re looking for a Bellingham SEO Company, you’ve probably heard a little about search engine optimization. But what is it really? Search Engine Optimization is a fine art. Google tells you exactly how you can improve your site’s visibility online in this publication. It’s a great guide for do-it-yourself people because it comes from the ultimate authority in SEO. It’s a beginners guide, but you need to get these things right or nothing else seldom matters. When we started out in 2007, SEO was pretty simple. You had to make sure you got the basic essentials right. If you wanted to get found in the top positions on Google’s result pages, you could buy a domain for the exact keyword or keyword phrase you wanted to get to #1. These are known as EMD’s – Exact Match Domains. 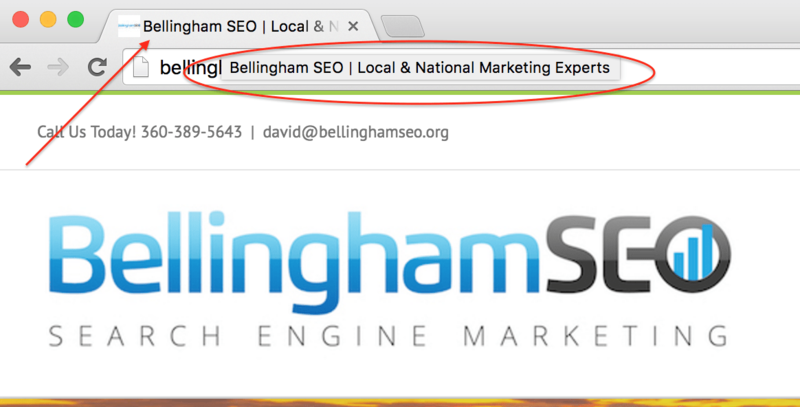 So let’s say you wanted to be ranked on the first page for “bellingham chiropractor”, you would have bought the name “bellinghamchiropractor.com” or .net, or .org. That used to be a very strong indicator to Google and the other search engines of what your site was about. It used to be you’d see all kinds of crazy things in the Title Tag, but most people don’t even notice – just the robots that crawl the site. People would stuff as many keywords as they could there to try to game the system. Do that today, and you’ll get penalized BIG TIME! 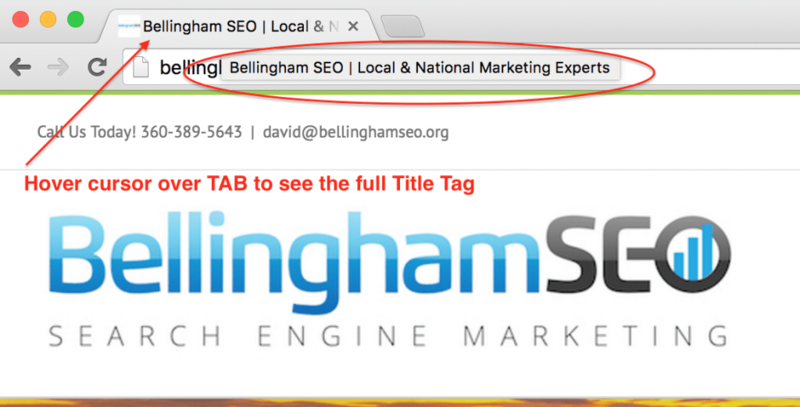 Today the title tag is mostly reserved for the name of your business and either name, address, and phone number (NAP), or a tag line or slogan. The above example uses “yoursite.com/keyword-phrase” structure. If your site is an HTML site, you need to make sure you get this right each time you add a page to your website. We really like WordPress sites as they make these things much easier! In the Permalinks settings, you can set the way you want the URL to be for each page or post and not need to think about it again – set it and forget it! These are the first three results for “bail bonds Bellingham”. The meta description serves as a brief description of what that page is about to both the searcher and the search engines. Even though it’s not considered as important in SEO as it used to be, it’s never a bad thing to to get the little things right because they all add up. The above are examples of “On-Page” SEO. There are many other factors consider in on-page, such as how many times to use the keyword you want to rank for, other terms that are related to your primary keyword, images and the use of Alt Text, etc… Some of these you can check off on a checklist, some things need to be researched within the niche you are in. Off-Page SEO is the influence other websites have on your site’s rankings in the search engine result pages. When there is a link on another site that refers back to yours, often times it is a vote of confidence to the Google bot. In years past, you could game the system by getting thousands of links embedded in low quality articles that were posted on article directory sites. But in the past several years, Google has refined it’s algorithm to be able to see patterns of a devious webmaster who is trying to game the system. Today, some of the best places to start out to make sure you get the benefit of strong, healthy links back to your site that the SERP’s like are on your Facebook, Twitter, Google+, and other social media sites. Getting the link on these sites is easy, but you need to pay special attention to how your NAP (name, address, and phone number) appears on each site. You can’t afford to get these wrong or you waste a good opportunity, and heaven forbid, your competitor has a great seo company that does and smokes you where it matters most – in Google, Bing, or Yahoo! Finding a great Bellingham SEO company isn’t really that hard – you’ve found us! As you can see from above, there is a lot to this. And this is just a thumbnail sketch of what you need to do to compete today. We will do a free analysis of your site and exposure online, and we’ll even show you how you can do this yourself. But if you’re like most business owners, you simply don’t have the time. Go to our Discovery Form and fill it out. It takes five minutes and it will best let us understand how we can help you completely dominate online and get more leads.